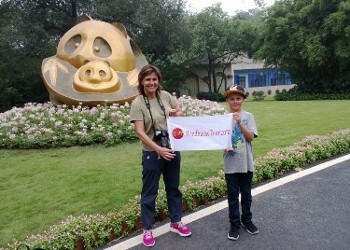 A remarkable experience with a 1-day volunteering tour in Chengdu Panda Base. Mr. Lu was so accommodation to me and my 9-years-old. He ordered up perfect weather, good panda action and an overall never-to-be forgotten experience in China. He even accompanied us back to the airport and helped us get back on flight to Shanghai as our time in Chengdu was limited. feeding "51" for mom, holding baby panda for son.